University of Kansas Chancellor Bernadette Gray-Little invited members of the KCUMB administration to attend a luncheon on April 14 recognizing Sen. Jerry Moran as recipient of the Champion of Science Award. The Champion of Science Award recognizes members of Congress whose actions and voting record consistently reflect their belief that basic scientific research is essential to the nation's ability to address pressing issues in health, security, energy and the environment. KCUMB and KU partner in a number of ways, including research. Our University is a member of Frontiers: Heartland Institute for Clinical and Translational Research, funded by a $20 million Clinical and Translational Science Award from the National Institutes of Health. Frontiers provides an academic home for clinical and translational research, and represents collaboration between KU, KCUMB and the University of Missouri-Kansas City. In addition to Frontiers, our researchers are currently collaborating with their peers at KU on projects related to ALS, Alzheimer’s Disease and Parkinson’s Disease. 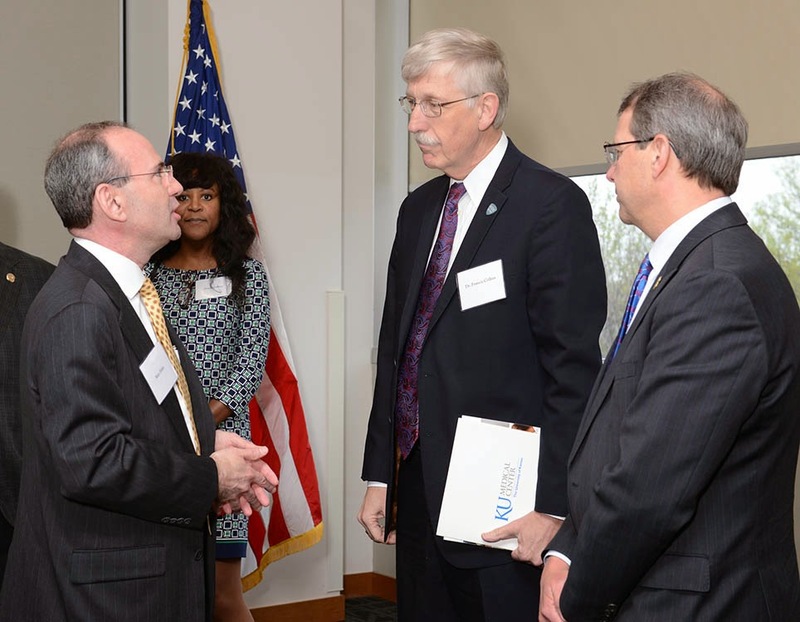 Francis S. Collins, M.D., Ph.D., director of the NIH and a friend of Sen. Moran, was also in attendance. He oversees the work of the largest supporter of biomedical research in the world, spanning the spectrum from basic to clinical research. We were honored to be a part of this ceremony and congratulate Sen. Moran on this recognition.